TUCSON, Ariz. — Teachers work two jobs so they can buy boats and other luxury items, Arizona’s House Majority Leader Republican John Allen said recently. Here in Tucson, K-12 teachers get starting annual salaries in the $30,000 to $35,000 range, the same starting wage as city bus drivers, and a wage far below that of most other professions requiring a bachelor’s degree and professional licensing. Arizona ranks 50th in the United States in elementary school teacher salaries adjusted for cost of living, with an average salary of about $42,560, only three-quarters of what teachers earn in other parts of the country. Given these low wages, it’s no surprise that the first bit of advice many new teachers receive is to marry a doctor or a lawyer. Both this advice, to marry for security, and the extremely low salary offered in a field where 76 percent of teachers are female, demands attention in relation to gender-based inequities and social justice. Because 19 percent of Arizona families have a female head of household, these low salaries contribute to a large number of children in our state living at or near poverty levels. Why don’t we hear more outcry, particularly in places like Arizona where there is an acute teacher shortage and where Gov. Doug Ducey is responding to this teacher shortage by signing a bill that de-professionalizes teaching, lowering standards for teacher certification? Doesn’t he get it? The problem isn’t that people can’t meet the standards already in place (standards necessary to ensure that the most intelligent, skilled and caring individuals work with our kids). The problem is that people don’t want to go into a profession that requires they accept a poverty wage. This is not an abstract exercise in feminist principles, but a daily battle not only for the women and men who have chosen teaching as their profession, but for their students and our communities more broadly. Teacher well-being translates into student well-being. If we paid teachers in Arizona what we pay lawyers, architects, IT professionals, engineers, CEOs, doctors or other highly respected, highly compensated professionals, our teachers wouldn’t have to take second jobs and might have more energy, creativity and time to invest in our community’s children. We might not lose one out of two teachers within the first five years of their fledgling careers. And, according to this same report by the National Center for Education Statistics (U.S. Department of Education), this appalling attrition rate is directly influenced by starting salaries, and is even higher among teachers of color. It’s certainly one of the reasons that, two and a half years ago, I left teaching to become a coordinator for refugee K-12 education in Tucson to support and train classroom teachers, to help refugee parents better understand and become advocates for their children within the U.S. school system, and to support the learning, achievement and integration of refugee and immigrant students through after-school programming. Raising teacher salaries is not the only step required to attract the best and brightest to the teaching profession; there are larger structural issues and concerns regarding working conditions to be addressed. But, it is a critical first step toward bringing highly qualified, motivated and diverse individuals into our classrooms. What will it take? A slight increase in property taxes? We can do that. Increase the investment by the Arizona legislature in public schools? There is support for public financing of education. Arizonans rated education as the most important issue in our state and approved Proposition 123 to increase education funding. An endowment from a bold philanthropist? We’ll accept such infusions of resources and hope. Teachers standing up for their rights and not letting themselves be coopted by their love of their students, our children? We have the power for such action. We must remember that teaching is absolutely not charity work. It’s a calling. It’s a profession. It’s the heart of our democracy and the hope of our future. Patricia MacCorquodale, a professor of gender and women’s studies at the University of Arizona and a Tucson Public Voices Fellow with the Op-Ed Project, contributed to this article. 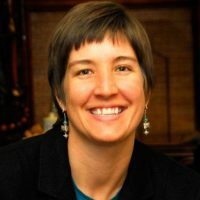 Julie Kasper is a National Board Certified Teacher who works with and for K-12 refugee students and English Language Learners in Tucson, and is a Tucson Public Voices Fellow with The OpEd Project. Excellent content. Women's work, thus low pay, and an attitude toward children that suggests, "that's good enough" for them isn't discussed often enough. AZ movement to charters and vouchers will do nothing to improve the situation. It will increase property taxes to cover what goes to foundations and corporations by way of profit. Read the dianeravitch.net blog...great education for us all. Appointed to Department of Ed by Pres Bush...saw the results of NCLB and Race to the Top...predicted the situation as it is today...and ways to change it. If you want to earn more money...CHOOSE a different major in college! Choose a degree that is more difficult to earn! I find Jake Valdez' comment upsetting on so many levels. The Master's Degree in the Educational field as well as licensure, both of which are required for employment in NY State at least, are not easy credentials to obtain. There are many careers requiring an Associate's degree or less that pay a higher wage than the salaries of teachers in Arizona. But this article is not just about teachers complaining about low wages. It is about the value we place upon the quality education of our children, which will not take place without quality educators. Passionate, talented, and dedicated teachers are needed to ensure a future generation that is prepared to meet the challenges of the kinds of careers available in the future. If we cannot promise these individuals a living wage, they will go into another field, or move to a state that DOES pay a living wage (such as NY, which is one of the reasons I returned to this state to raise my children). Your statement devalues the importance not only of the profession of teaching, but of the many lives that are impacted by the quality of teaching they receive. I am wholeheartedly willing to pay higher taxes to ensure that my children are prepared to become productive adults, and the compensate those individuals who touch their lives in a meaningful, significant, and critically important way. I would like to add that my son is autistic and receives multiple special education services at our public school. I cannot put into words how much I appreciate the efforts of his teachers and staff, and I know how challenging the field of special education has become. His lifelong potential will be positively impacted by their efforts, and for this I am grateful. As a former teacher, I do not believe that teacher pay is that bad. For one, we only work 9 1/2 to 10 months out of the year. No other profession gets a full 2+ months off. On top of the 2 months off in the summer, we still got vacation and sick leave, and many holidays. On top of that, we got above average health care at below average premiums, and way, way above retirement benefits. Yes, my monthly wage was slightly below that of some of my friends and neighbors, but I was home with my kids on the days they were out of school while my friends had to pay expensive day care. All things considered, I think that I made just as much money and had more flexibility than my friends and neighbors in other professions. Rather than focus on teachers marrying a doctor or lawyer, please place the focus on how to better equip future doctors & lawyers, and perhaps the plight of teachers' salaries might be resolved in the process! The problem with US public education today is it is viewed by too many as an entitlement rather than a privilege, free to participate in or not, free to take advantage of or not, and too much focus is spent on time & process than achievement. Why is this assertion correct ? Look at students in the US public education system who do achieve - they often are sons & daughters of highly-educated immigrants whose path to the US was education, discipline, and expectation, not a process steeped in entitlement. It all starts in the home - parents who lovingly yet steadily reinforce the value of extracting as much as possible from education tend to realize that goal fulfilled. These families often spend hundreds or thousands of dollars annually to further enrich their children's education, and to ensure they're not ill-equipped by an education system which has a mostly one-size-fits-all paradigm. Contrast this with parents who are physically, mentally, psychologically, or spiritually absent in the home, and who do not instill in their kids the *necessity* to "be all they can be" by maximizing their educational opportunities. Many billions of dollars have been spent trying to re-engineer these situations, and unfortunately, in cynical resignation, State & Federal education standards have been "dumbed-down" to not let the lower quadrant students have damaged self-esteem. High School AP classes & Honors classes in Middle & High Schools provide some elevated challenge, but the goal should be to adapt a child's education per his/her readiness & potential, not unlike new adaptive testing methods which will be introduced in Common Core, ACT, and SAT assessments in the near future. Why would ONLY tests be adaptive in nature when the curricula they're testing NOT be adaptive? This paradox is what stifles US education & results in our students' international test scores declining with every periodic administration. The frank reality is twofold - there are students who don't want or see need for their education & in the process hold back thousands of others who do want to invest in their futures, and sadly several decades of hundreds of billions of dollars spent haven't changed this dynamic; and our society & our world need students who have both the potential & desire to become top achievers to meet our current & next generation needs. The problem is the family or parent which abdicates its responsibility to nurture its child to become a productive member of society rather than bleeding from it. Try is it may, the education system cannot fulfill the role of surrogate parent, nor should it, if nothing else, based on several decades of the grand experiment only making things worse for US students en masse. Not allowing the best & brightest to rise to their full potential is tantamount to societal suicide, as the growth & magnitude of problems facing society are outpacing our education system's ability to resolve them. Our society's current compensation for this problem is to import well-educated persons from overseas to meet the dearth of native-trained engineers, scientists, doctors, dentists, and many other disciplines. So the next time Silicon Valley or Wall Street or Academia or the Elites decry their inability to recruit enough talented people, instead of looking outward or overseas they should look within to question why their short-sighted social engineering policies applied to US education have resulted in the very plight they bemoan. The only way forward is to give every student a way up which best prepares him/her for the brightest possible individual future. Curricula & standards must be re-envisioned to provide challenge, opportunity, variety, and adequate outcomes to fulfill both individual purpose & society's needs, especially for a society whose needs evolve continuously. Many jobs & occupations which will exist in 2037 don't exist today, and many haven't even been envisioned. An educational system which is more focused on the lowest common denominator rather than maximizing human potential has already been proven faulty - to continue it or worse yet, double-down on it via nationwide standards enforcement, is to fulfill Einstein's reported definition of insanity.